This recipe for Blueberry Amish Friendship Bread Muffins makes a breakfast that is both easy to make and bursting with flavor. It’s one of our favorite Amish Friendship Bread breakfast recipes in our Recipe Box! 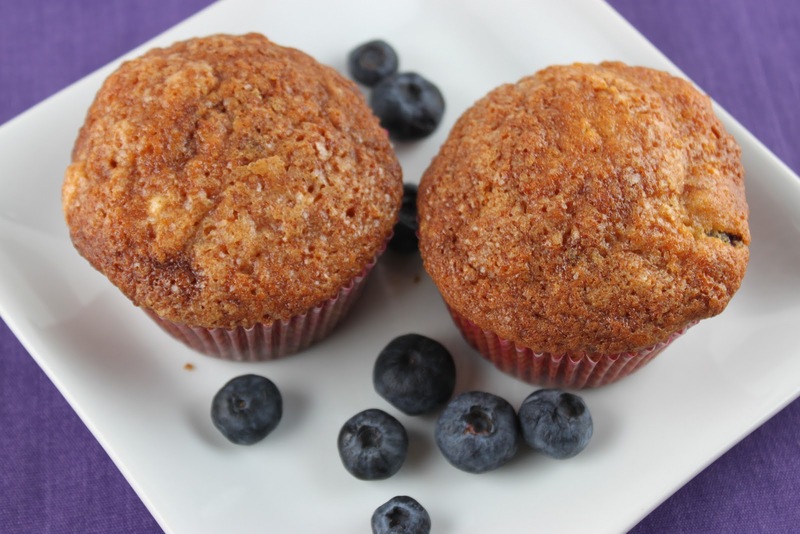 The plump, fresh blueberries in this recipe make Blueberry Amish Friendship Bread Muffins a breakfast treat. In a large mixing bowl, mix all ingredients together except for blueberries and Cinnamon-Sugar mixture. Once mixed, fold in blueberries. Dust the tops with Cinnamon-Sugar mixture. Bake for 20 minutes or until toothpick inserted in the center comes out clean. I love blueberry muffins. What’s the most blueberries we can put in? Why use cupcake wrappers? If you spray the cupcake tins with vegetable spray – yes, use an icecream scoop for easy portioning – the muffins come out easily, and you avoid having much of the muffins sticking to the wrappers, a waste all the way around, and much less messy. This is a great place to start a family connection! I look forward to sharing my starter and teaching my grandchildren the same! One question….can you use frozen or do you have to thaw before baking? Hi Betty! Some people drop frozen blueberries straight into the recipe–we like to run ours under cool water and pat dry (really dry) before using. If you want to try using them frozen, add an extra 5 minutes baking time. Good luck! I made a struesal topping for these out of flour, brown sugar and butter and cinnamon…this is perfect for these muffins! Leaving the rest of the recipe the same, I substituted the blueberries with one cup raspberries. Results are delicious!!!!! Oops, sorry. I also omitted the salt. I don’t understand why people still insist of adding minute amounts of salt to baking. It amounts to what – 2 grains of salt per muffin? Can’t taste it. I think the salt is less about flavor and more about how it reacts chemically to other ingredients in the recipe. According to Shauna Sever, “In bread baking, salt controls yeast growth and has a strengthening effect on the gluten in the dough. In pastry-making, it helps cut the oily mouthfeel of buttery doughs and encourages browning.” http://shaunasever.com/2011/06/why-salt-is-important-in-baking.html. Hope this helps and I really appreciate your feedback and Kitchen Notes, Lindsay — keep them coming and thanks for asking great questions! These were great! I’ve made them for work tomorrow. I used olive oil and 2 cups of blueberries but everything else was the same. They taste a bit too vanilla pudding for me, so next time I think I’ll use only one pudding and make it lemon with some zest. There’s also plenty of oil in these so you don’t need to spray or use muffin cups if you are careful. Thanks for the recipe! No one has had an issue with metal baking pans ruining the muffins? I haven’t made these yet, but would like to. Most of my AFB recipes I’ve made I bake in Pyrex due to the warning about not using metal. Just wondering! I have a ton of starter left over so i had to triple this recipe just to use up one bag. Thats a lot of tester muffins! It was risky incase they didnt come out good. But actually they are great! I added more blueberries than the recipe and had to use half whole wheat flour cuz its all i had, and i didnt have vanilla pudding boxes so i added two packets of plain gelatin, equal parts sugar and a teensy biy of salt and a teaspoon of vanilla extract. (But remember, i triped the batch so 1/3 of these ingredienta would work with this recipe) Did i say how awesome they came out? Thank you so much!! You’re welcome, Laura! Remember you can freeze your starter if it ever gets out of hand and have it ready whenever you have an inkling to bake. A little starter goes a long way, that’s for sure. Thank you for leaving a comment and sharing your Kitchen Notes! I am going to make these for my husband and son! Can you substitute sugar free pudding instead of regular?